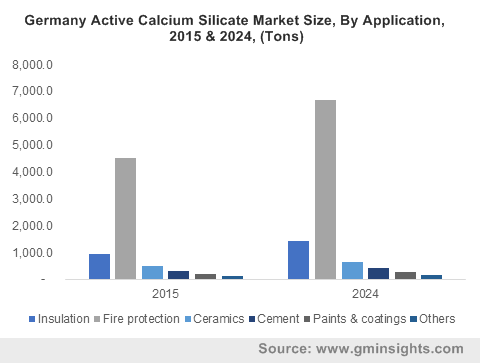 Active Calcium Silicate Market Size « Global Market Insights, Inc.
Strong growth in the infrastructural spending has carved a profitable growth map for the global Active Calcium Silicate Market. Active calcium silicate finds extensive application in the construction industry, owing to its properties such as high-temperature stability and sound absorption. Active calcium silicate market offers a wide product availability in the form of powder, boards, blocks and is used for fire protection, in Portland cement, acoustic insulation, ceramics, and paints & coatings. Active calcium silicate industry has witnessed an upsurge with rising demand from the construction projects including airports, flyovers, highways, fire stations, and other commercial complexes. As per statistics, the global construction spending in 2015 exceeded USD 7 trillion and is projected to record over USD 15.5 trillion by 2024, expanding at 7.5% CAGR over 2016-2024. Within the global construction expenditure, Asia Pacific held for more than 20% in 2015, owing to rapid infrastructural growth in the emerging economies. China is witnessing significant government initiatives toward installing fire protection in commercial and residential buildings, which in turn is stimulating the regional active calcium silicate market. Moreover, presence of huge industries including plastics, paint & coatings, rubber, and cements manufacturing units have accelerated the product deployment for high temperature insulation applications. This has boosted the product demand in China and the regional active calcium silicate market is projected to surpass 15 kilo tons in term of volume by 2024. The global active calcium silicate industry is set to garner huge profit from its fire protection applications. The product is widely used in boards & blocks form in oil refinery, blast furnace, building walls, and electric arc furnace. Active calcium silicate market share from the fire protection application is estimated to generate sales of USD 135 million by 2024. The EAPFP (European Association for Passive Fire Protection) has imposed regulations and guidelines regarding the harmonization of fire safety standards for the commercial and residential buildings. Properties of active calcium silicate which includes adhesiveness, intumescent, and fire resistance have broadened the application scope to acoustic tiles and wallboards. Supportive regulations by ASTM in the United States to formulate, direct, and regulate fire safety standards and to conduct test methods on acoustic and thermal insulations have significantly favored the regional market growth. U.S. active calcium silicate industry, owing to such favorable support, is expected to grow at 3.5% CAGR over the period of 2016-2024. Apart from US, these test methods and quality standards are also heavily regulated across Germany, Italy, and France. Another strong application trend of active calcium silicate is in Ceramic Tiles Market, which is anticipated to grow at a rate of 9% over 2016-2024. The overall active calcium silicate market from ceramic application is likely to register a growth rate of 3.5% from 2016-2024, owing to growing application in false ceiling, plaster of Paris, tiles, and roof manufacturing products as it possesses properties such as hardness, high melting point, corrosion resistance, and light weight. These advantages of ceramics have propelled its heavy demand in replacement of tiles for improved aesthetic appearance. Brazil active calcium silicate market is poised to see a consumption exceeding 90 tons by 2024, owing to growing trend toward high quality ceramic tiles as a substitute for conventional walls and floors. According to Global Market Insights, Inc., active calcium silicate market is projected to generate revenue worth USD 215 million with the global consumption target of 119 kilo tons by 2024. The global active calcium silicate market is also witnessing an upliftment with surging trade statistics. South Africa, UAE, and Saudi Arabia may witness product shortfall and can thus increase its product import. However, this scenario can provide a fair opportunity for the regional manufacturers to boost their manufacturing activities to balance the regional demand. The global market experiences a fierce competition among the industry players. Prominent active calcium silicate industry players include Promat International, Ramco Industries, American Elements, Imerys Filtration Minerals, 2K Technologies, Anglitemp, and HIL Limited. This entry was posted in Bulk & Specialty Chemicals and tagged Active Calcium Silicate, Active Calcium Silicate Market, Active Calcium Silicate Market Analysis, Active Calcium Silicate Market Forecast, Active Calcium Silicate Market Growth, Active Calcium Silicate Market Outlook, Active Calcium Silicate Market PDF, Active Calcium Silicate Market Price, Active Calcium Silicate Market Report, Active Calcium Silicate Market Share, Active Calcium Silicate Market Size, Active Calcium Silicate Market Trends, Cement, Ceramics, Fire Protection, Insulation, Paint & Coatings.